Trees are an important and vital part of human survival and an essential part of biodiversity. The forest trees are renewable sources of wood, timber, food, fodder, fuel, and other valuable non-timber products, and due to increase in population and the ardent desire of human being for survival, there has been a constant reduction in forest from the earth’s surface. The current scenario of global climate change threatens to hamper the agro-ecosystems by drastically affecting the key components of environment such as temperature, pattern of rainfall, drought, and water logging. These changes not only affect productivity but are also responsible for decline in the quality of fruits, and litchi (Litchi chinensis Sonn.) is one of them. Several conventional approaches have been exploited in the past for the promulgation and improvement of litchi. However, such efforts are confronted with several natural drawbacks and need extensive research to solve the challenges. 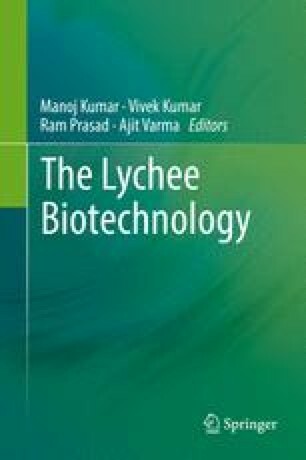 The application of biotechnological tools for in vitro regeneration, micropropagation, and genetic engineering in litchi species has been applied with success, especially in the last decade, and by the help of genetic engineering technology, it has become possible to introduce desired genes in a much simpler way in litchi. This chapter reviews some of the basic aspects and advancement made in litchi propagation and genetic transformation techniques for further improvement.